The next step for the Amazon Echo on its path to becoming the center of your smarthome might not be the place you'd expect: your dog's food dish. Amazon announced today that Petnet, an internet of things pet care company, is the latest project to receive funding from the Alexa Fund - Amazon's developer-facing investment firm. The funding will go towards creating products that integrate with the Echo, including smart food dishes that "keeps owners informed of proper feeding portions and delivers insights to them about compatible ingredients specific to their pet's age, weight and level of activity." 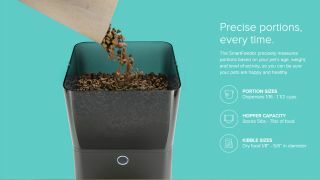 The device Petnet currently makes is called the SmartFeeder, which until now used an app to track meal frequency and food levels inside the device. The only example command listed by the company so far is, "Alexa, how much has Max eaten today? ", though it doesn't appear to be out of the question that you'd be able to ask how much food is left in the feeder and when the last time 'Max' has eaten. While it's still early in development, the idea sounds cool for pet owners looking for stats on their furry friends. Petnet joins nine previously funded companies - Musaic, Rachio, Orange Chef, Scout Alarm, Garageio, Toymail, Dragon Innovation, MARA, and Mojio - alongside other IoT devices like the Philips Hue lightbulbs and Samsung Smart Hub to get Echo support. iOS 9 tips and tricks to get you started on launch day!